The large crowd certainly got value for money as St.Oliver’s captured the U-16 Division 3 league final in dramatic circumstances thanks to a last minute Sean Reilly free in Kells on Tuesday evening. The town pitch in Kells was the venue for an enthralling battle, even though St. Oliver’s never trailed in the game at no stage did manage to pull clear of a Jenkinstown team that showed tremendous resilience. The St. Oliver’s outfit consisted of Moylagh/Ballinlough/St. Brigid’s while there opponents were a combination of senior clubs Moynalvey and Blackhall Gaels. St. Oliver’s possessed a potent full-forward line; Jamie Mc Gee, Daniel Gerrard and the brilliant Joseph Blake registered a combined tally of 4-6 and gave the Jenkinstown full-back line a torrid evening. Jamie Mc Gee opened the scoring in the second minute after he pounced on a loose ball and finished to the net, Blake then put his team further ahead with his first point of the game. Full-forward Hughie O' Sullivan was magnificent for Jenkinstown Gaels and despite St. Oliver's double marking him for much of the match he still managed to display all the skills associated with his older brothers and county senior players; Mark and Cillian. Brian O' Reilly was also prominent in the Jenkinstown attack and he combined with O' Sullivan to get the scoreboard ticking. Sean Reilly and Kevin Gilsenan held the upper hand for St. Oliver's at midfield in the first half and their intelligent use of possession created many openings and once again the North Meath men rattled the net when Mc Gee and Gerrard combined to bundle the ball over the line following a goal mouth scramble, they led 2-4 to 0-4 midway through the half. But their two goal lead was short lived and Hughie O’ Sullivan responded with a great goal from a tight angle for Jenkinstown Gaels. The teams traded points to leave it 2-6 to 1-6 approaching half-time but the North Meath outfit received a timely boost before the break with a great individual goal from Gerrard. A long ball was played towards the Jenkinstown goal and the goalkeeper advanced to collect the ball neatly, but he met with a strong shoulder from Gerrard and as the ball spilled loose the corner forward showed tremendous strength to stay on his feet and grab possession before steering the ball into the roof of the net with his left foot. The score was well received by the St. Oliver’s supporters and it left his side two goals clear; 3-6 to 1-6, at half-time. The Jenkinstown Gaels management sent their team back out for the second half with renewed determination and led by Conor Harnan, brother of senior county star Padraic, they set about clawing back the lead. They hit a goal and a point straight after the resumption to reduce the deficit, 2-7 to 3-6, three minutes in to the second half. But despite this setback St. Oliver’s didn’t panic and Gilsenan and Reilly started to gain some parity with the outstanding Harnan. Gilsenan kicked a great score and then Blake produced a sublime finish to leave his team two goals clear again midway through the half. Jenkinstown made one last push to get back into contention and with Brian O’ Reilly running at the heart of the Oliver’s defense at every opportunity the two goal lead slowly started to whittle down and only a brilliant save from Dylan Scully in the St. Oliver’s goal kept his team four points ahead with ten minutes remaining. The St. Oliver’s defense stayed strong despite sustained pressure, but they conceded a number of close range frees much to the dissatisfaction of their supporters and when Jenkinstown leveled, 2-15 to 4-9, with only a minute left it looked like the momentum was with the senior clubs as they went in search of victory. Having seen their lead disappear the North Meath men showed great composure to conjure one last attack and when Joseph Blake seen this shot blocked down he did well to regain possession and then he went down under pressure only for a free to be awarded 30 meters from goal, but the kick was moved forward for dissent and Sean Reilly tapped over the winner as the full-time whistle was sounded immediately, it was a harsh ending for a gallant Jenkinstown side. St. Oliver’s celebrated as their captain; Conan Smith accepted the cup from Ultan Fitzpatrick. 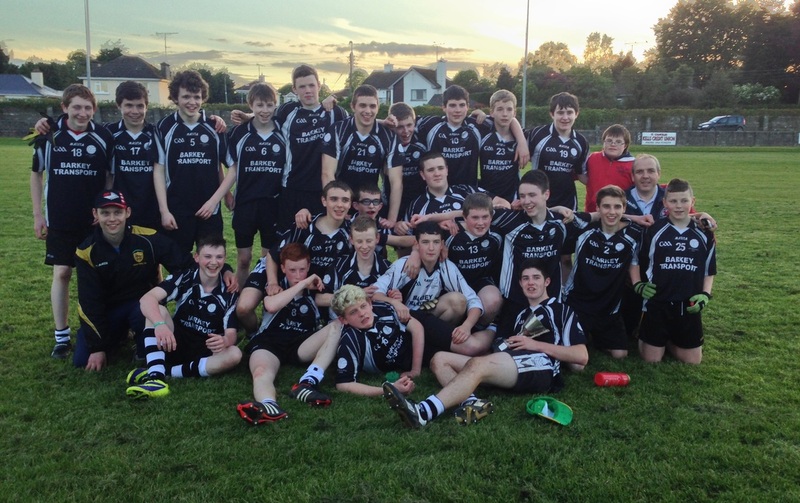 St. Oliver's: D. Scully, C. Fleming, C. Smith, R. Mc Givney, M. Corrigan, D. Gibney, O. Smith, S. Reilly, K. Gilsenan, TJ. Tully, E. Mc Cable, S. Gibney, J. Mc Gee, J. Blake, D. Gerrard. Subs: J. Doyle, D. Tighe, A. Moore, A. Segreaty, N. Mc Donnell, D. Moore, C. Gibney and C. Tully.